You need to know this. You always have the option to feel however you choose to feel. This is always available to you. Sometimes we choose to feel sad, angry and frustrated, and that's fine. That's your choice. You can choose to feel however you want, but you have to know and remember that it’s always a choice. Your choice. Loving the one you’re with… for selfish reasons. Just because you want to feel love. It’s totally your choice. I know many of you will see how this can apply to your relationships too. You know how you get into a new relationship and everything is great and then you start to see all the things about that person that you don’t like? The mind will do this if it’s not directed to think thoughts on purpose that create the emotions you want… No matter how wonderful you thought he was or wasn’t in the beginning. If you were following along and did your assignment from last week, you’ll have started to observe your confirmation biases. This is when you collect evidence to prove the negative or positive thoughts you have in any given situation. What if you could feel love all the time for your partner? What if it’s not just in the beginning that you feel love and then it goes away or disappears? The option to feel love in your current relationship AND your job is always available to you right now and in every moment. So if you want to leave your job or your relationship, I recommend you love it first. What you don’t realize is that you don’t have to change your situation: the “relationship" or the “job" to feel different. You have the ability and choice to feel differently now in that same exact situation without changing it. So how do you do it? This is what I promised you I’d tell you last week. Take time to write down the thoughts you have about your current job or relationship. Write down all the reason you’re “quote unquote unhappy.” Your mind will come up with all the reasons and justifications for your dissatisfaction. One I hear a lot, is “well I just don’t love him anymore,” or “I have fallen out of love with him.” But you can't FALL out of love with someone. You think thoughts that don’t cause the emotion of love, that’s why you don’t feel love. When you know you have the power to love the one you’re with or that job of yours, life’s possibilities open up whether you CHOOSE to stay or go. — "My boss is a jerk.” Ask yourself, “so what?” So what that you think your boss is a jerk? And answer that question. You’ll understand the thoughts (or sentences in your mind), that are leading to the feelings you have about your situation. — "I’m making it mean that I’m not doing a good job.” Ask yourself is that true? You know what 99% of people say, “no,” I know I am good at my job? JACKPOT! Your thoughts are not always valid, which is why we need to take a look at them. Often times your thoughts go unquestioned, and you don’t even realize you are thinking them. Let alone have a chance to change them. If I were coaching you here’s where I’d tell you that your boss’s thoughts about you have nothing to do with you, but everything to do with her, and how she is thinking. If she's yelling, manipulating and complaining that’s actually not because of you. It has nothing to do with you, but everything to do with her. Namely, her thoughts—that cause her feelings—and from her feelings, she is acting this way. You’ve interpreted this to mean a lot of thoughts about yourself and her that make you feel dissatisfied with your job. But that’s not even necessarily true. See the power in questioning your thoughts? Now you can do this with other aspects of your job you dislike and you’ll get the picture. You can also do this with your relationships. Crazy huh? The power you have. Stop handing your power over to people because you think they cause your feelings, which they never do. It’s always because you are thinking a thought that causes whatever feeling you have about any give situation in life. Can you imagine that all you’ve to do to like your job (or relationship) is to CHOOSE to like it? This isn’t about convincing yourself to like something you don’t. It’s about thinking thoughts on purpose that create the feelings you’d like to have. Heck no. When I ask my clients how they’d like to feel about a situation, often times they’ll say “neutral.” Because they’re currently feeling so negative. But I want you to understand that you can choose to feel any emotion, so why not feel one you really want. LOVE is an amazing emotion. I don’t know anyone who’d not want to feel love. So this one’s a good one to shoot for. This is where the selfish part comes in. You’re not generating these feelings for your job for your job’s sake or your boss in the example above… But just so that you get to feel love. Same with your relationships. The love you feel for your partner is for you. First ask yourself what thoughts generate neutral feelings? Neutral Thought: "I’m actually good at my job." I’ve seen clients who hate their job, do this work and actually come back and tell me they love their work and have decided to stay. It was just their thinking that was creating their dissatisfaction. I’ve also seen this in relationships and marriages. 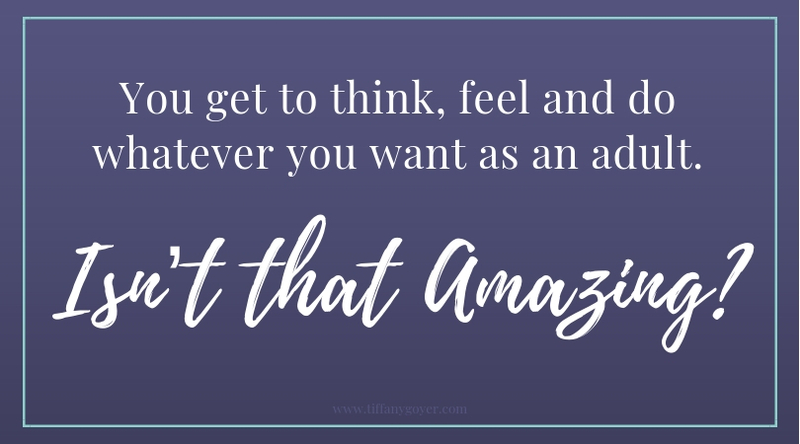 Clients will tell me “it’s just over,” and then they started with this thought work to begin to create thoughts that generated more positive feelings and guess what? They ended up feeling better about their relationship and realized they wanted to stay and don’t have to be as sensitive to what their partners do, or expect their partners to make them feel better. It’s your CHOICE. You get to think, feel and do whatever you want as an adult. Isn’t that amazing? You’ve got to keep in mind that when you’ve had thoughts that you don’t like your job or your romantic partner, those thoughts lead to negative feelings like, frustration, anger, resentment & boredom. Just insert whatever your regular emotions are here. Then you can ask yourself, “What’ve I been thinking that’s causing that emotion within me?” Ask yourself, “Is that thought serving me?” If the answers no you have the power to change it. These feelings influence the actions we take (or reactions or inaction). Which affects our job performance, or how we show up in relationships. Transitions can be challenging. You may be tempted to walk away from what you’ve got to build something new, but what if you just worked on being masterful in your thinking. What if you decided to think on purpose and create your feelings on purpose. You could actually be happy where you are. No matter what you CHOOSE to do a relaxed mind is a creative mind. So do your thought work on the regular! You’ve so much more power over your ability to be happy and love that you know. I want everyone to have this information and that’s why I write to you. Your relaxed mind gives you space for your creative genius to flow and take over. In this space, it becomes much more clear if you can love that relationship or job you have, OR if it’s run it’s course and you’re truly ready to walk away. If you’re struggling to implement these ideas on your own, and I know a lot of you are, just understand that’s totally normal. A lot of times with this work we intellectually “get it,” but not so much on an emotional level and it takes practice to implement. That’s where a coach can come in handy. Give it a try and sign up for a mini session to see how you can apply these concepts to your life today! You can do it! Older PostHow and why you should love your job before you leave it.